Heinz became the latest company to get 'brand-jacked' on Twitter when @mrkhndy decided to start pretending to be its social media manager this week. This led Heinz to respond via its real Twitter account @HeinzUK, tweeting: "Whilst we appreciate loyal Heinz Beanz fans,we also appreciate transparency. Please visit @HeinzUK, the official Twitter of Heinz UK." However, this sparked a flurry of anti-Heinz tweets from the @mrkhndy account, including a number that subsequently appear to have disappeared. 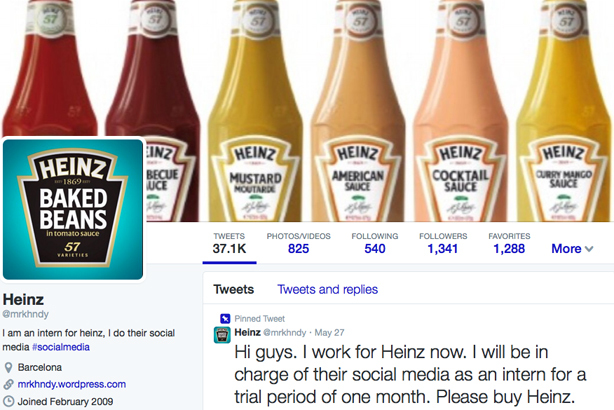 Heinz has reported the account to Twitter, which begs the question was its handling of the situation a hit or a miss? This is less of a brand-jacking, more like a mickey-taking, and it could have inspired a bit of priceless Twitter humour among Heinz fans. So when @mrkhndy, clearly not actually Heinz, starts smearing the brand with some kind of personal agenda, I could see that there was only one way the discussion would turn if dealt with in a formal or heavy-handed way. It was, and it did. Among what we saw, it appears, was some kind of cease and desist. @mrkhndy has been instructed to shut down his entire Twitter account. He has been on Twitter for five years and has tweeted more than 37,000 times. That’s more than me! And that’s why things went from bad to possibly funny, to a whole lot worse. What else could Heinz have done? Maybe offered @mrkhndy a job? The cost of a month's internship would have paid dividends in promoted tweet equity. Or at the very least some engagement on @mrkhndy's level, even though it seems he may have gotten a bit sweary. Sadly, what we saw was no fun for a consumer brand like Heinz.